Our local team are your battery experts and provide you with the very best advice on the complete Marshall Battery range of products. With sound advice and the best ultimate battery solution, Marshall Batteries is the one stop battery shop for all vehicles. Not only do we do car batteries, 4WD batteries and truck batteries, but marine batteries as well. We can recommend and install any battery application. Our range includes lawn mower batteries, and a wide range of vehicle, truck, boat and machinery batteries. If you need a deep cycle battery, 4WD battery, Quadbike battery or even a forklift battery in the Rockhampton region, we can assist you with the best product for your needs. And if we don’t have the battery in stock we will source your battery for your specific battery application. We can supply a full range of battery technologies including sealed maintenance free, low maintenance, (EFB) enhanced flooded batteries, (AGM) absorbed glass matt batteries, maintainable batteries, spill proof batteries, deep cycle batteries plus valve regulated lead acid batteries. These battery technologies are designed to suit all applications for passenger vehicle batteries, stop start batteries, SUV and 4WD batteries, light commercial batteries, heavy commercial batteries, plant and equipment batteries, motorhome batteries, caravan batteries, camper trailer batteries, golf cart batteries, marine batteries, watercraft batteries, solar batteries, industrial batteries, sweeper batteries, NBN batteries, scissor lift batteries, forklift batteries. Our batteries are specified to car battery OEM requirements or greater and provide specialist fitment of all automotive batteries. We offer a range of good batteries, better batteries or best batteries to meet many applications. Marshall Batteries Rockhampton supply a wide range batteries into the wider Rockhampton region including Allenstown, The Range, Rockhampton, Rockhampton Hospital, Red Hill Rockhampton, Port Curtis, Depot Hill, West Rockhampton, The Common, Wandal, Fairy Bower, Berserker, Park Avenue, Koongal, Pink Lily, Lakes Creek, Frenchville, Kawana, Gracemere, Neirmbera, Nine Mile, Central Queensland University, Central Queensland, Mount Archer, Norman Gardens, Parkhurst, Kabra, Limestone Greek, Alton Downs, Glenlee, Nankin, Midgee, Mount Chalmers, Glendale, Ironpot, Tungamull, Rockyview, Stanwell, Cawarral, Bouldercombe, Sandringham, Dalma, Etan Creek, Thompson Point, Coowonga, Joskeleigh, Kalapa, Mulara, Keppel Sands, Ridgelannds, Coorooman, The Caves, South Yaamba, Bushley so give our Marshall Batteries a call, as we can assist you. 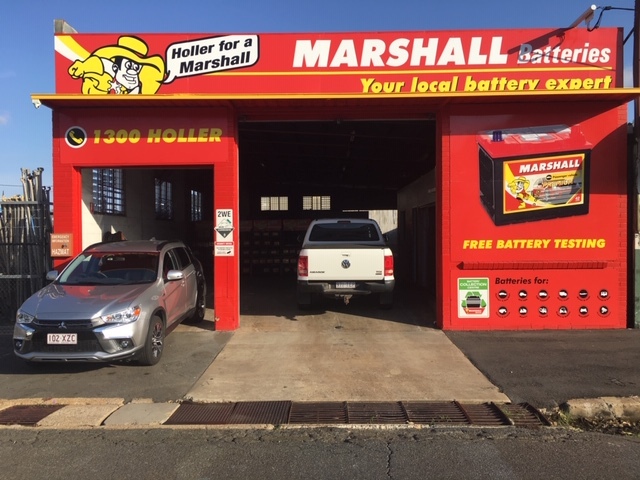 We are a Marshall Batteries stockists location with access to battery accessories including battery cables, battery terminals, tie downs, battery boxes, battery chargers, plus the legendary Marshall Battery Range also offering specialist local know how. Marshall Batteries Rockhampton is also a Battery Collection centre. Bring your used lead acid battery to this location for safe and responsible recycling. Environmental stewardship and recycling is a major focus in all Marshall operations Marshall Batteries manufactures new batteries which are 98% recyclable and 85% comprised of previously recycled materials, so help us support our environment and Re-cycle Used Lead Acid Batteries (ULAB) wherever you see the Battery Re-cycle sign, right across the country. Marshall Batteries provides a free extended battery warranty which covers you right across Australia, roadside day or night, for peace of mind.